Get rid of unwanted pests with Demon Max. Eliminate unwanted pests around building and structures with Demon® Max. Industry proven insecticide that provides knockdown and residual control. Multipurpose product that can be used indoors in crack and crevice treatments and outdoors for general pest control. The dual action perimeter application contains the active ingredient cypermethrin to control general pests. 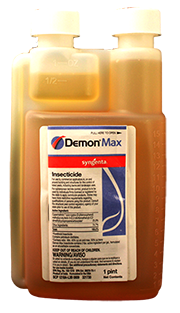 Use Demon® Max on lawns, turf, vegetation, and soil. Manufactured by Syngenta Crop Protection, LLC. Ants, Ant Mounds, Asian Cockroaches, Bark Beetles, Bees, Borers, Boxedler Bugs, Carpenter Ants, Carpenter Bees, Centipedes, Chiggers, Church Bugs, Cockroaches, Crickets, Earwigs, Elm Leaf Beetles, Fire Ants, Firebrats, Fleas, Flies, Ground Beetles, Gypsy Moths, Millipedes, Mole Crickets, Mosquitoes, Pillbugs, Scorpions, Silverfish, Sowbugs, Spiders, Ticks, Wasps, Wood Infesting Beetles and many more. See the label for the complete list.